More than 66,000 copies sold. Creating soaps at home - for family, for gifts, even to sell in quantity - is pleasant and rewarding. 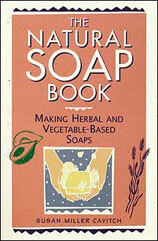 A soapmaker provides formulas and trade secrets for making high-quality vegetable-based soaps, with start-to-finish directions, supply and equipment tips, and ideas for the final product.